Although it is important to stay away from heat damage as much as possible but using a much lower heat setting can lead to even more damage. It is therefore better to set the straightener at a medium temperature. Do not use a round brush: avoid using a round brush once you have straightened your hair. You can use a flat paddle brush instead. 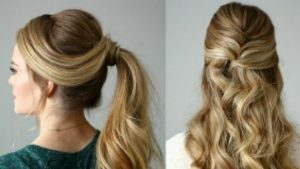 Utilize the cool setting: once the hair has been straightened, you can utilize the cool setting of the hair dryer to set the hairstyle in place. Use appropriate shampoo and conditioner: you should be aware of what type of shampoo and conditioner are being used. These products must contain a formula that aids in keeping your hair straight. Maintaining the volume of your hair: when you flat iron your hair, its volume tends to get lost. Therefore, the next time you use a flat iron, you must remember to pull your hair up as you straighten it, so as to give it a lift at the root. Use of heat protectants: heat protectants are quite useful products which can be used before using the straightener, so that the hair can be protected from damage. Never use serum before straightening: hair serum must never be used before you flat iron your hair. It is better to use serum on dry hair instead. Keratin treatments and hair straightening: many people think that keratin treatments make the hair straight. It smooths out the texture of hair and eliminates the huge amounts of frizz, but your hair will not become straight after this treatment. These guidelines will really help you once you have decided to get your hair straightened, so that this heat treatment causes less damage to your hair.